With thousand of podcast managers doing the rounds on the iOS platform, choosing the right one can send any one’s mind in tizzy. Try Pocket Casts for iPhone, one of the innovative applications which have already created ripples on the iOS platform and ruling the roost among its adversary. Developed by ShiftyJelly PTY LTD, the app has fetched an outstanding 9+ rating on the App Store and accolades from Lifehacker and Macstories. It brings phenomenal features on the board to redefine the management of Podcasts at the best. Pocket Casts app is compatible with both iPad and iPhone. Pocket Casts app for iPhone provides an idyllic user interface which is very simple to use. 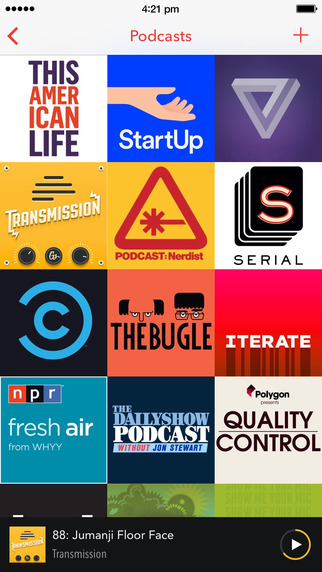 It permits a user search for podcasts and subscribes to them and allows one to organize it in a systematic and structural way, share and play. The app in-house a unique and powerful search tool to narrow down the direct search method of inputting a term and displaying the similar results, the similar way Google Play Store works. The app unveils numerous splendid features like playing an audio file at a variable speed which range from 0.5 x to 3.0 x, playing the videos directly on the TV with a single tap, dark and light themes, toggle video podcasts to audio and many more. The app costs $3.99 and can be downloaded from the iTunes App Store. The app supports numerous languages which include English, Danish, German, Japanese and many more. The uniqueness of Pocket Casts app lies in its ability to sync and back-up the contents. It permits a user to transfer subscriptions, playlists and podcasts to other iOS/Android devices, which is great if one upgrade to iOS/Android platform or if lose the device. Apart from this, the downloaded episode can be stored at any location and lets a user share their favorite podcasts, episodes and position in the episode among the peers. The application neither supports any marketing ads nor does it have episode limits or pushy trials. The filters in the app work next to perfection as it filter the files on the basis of the format and organize them systematically which defines Pocket Casts. The key feature of the app is its server which monitors the podcasts and refreshes it automatically. Pocket Casts app requires iOS version 8.0 or higher and a mere 8.1 MB free space for the installation. However, it is compatible with iPhone 5, iPhone 6 and iPhone 6 plus. It is a one-stop app for pretty much every podcast need one would have, creating a central location for all manner of compelling content. Grab a copy of Pocket Casts from the App Store and get mesmerized.